I recently completed a commission for LOEWE, an old leather company and fashion house based in Madrid and Paris. 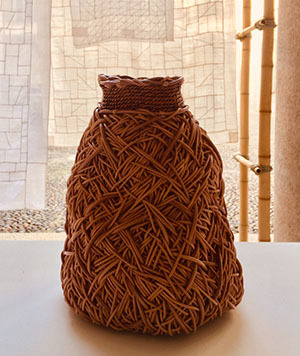 They commissioned about ten basket makers from around the world to reproduce our individual designs in the company's leather for Salone Del Mobile, an international exhibition in Milan, Italy. This was an exciting project for me and I really enjoyed combining the leather with willow bark for my first international exhibition! July 2019 I'll be one of the instructors at the National Basketry Organization Conference in Bowling Green, KY. These NBO conferences always offer a variety of interesting workshops and are a fun way to catch up with old friends and meet new ones. In October I travel to Hokuto City, Japan as a cultural exchange artist with the Berea sister-city delegation and will stay over to teach a number of classes in the public schools. This promises to be an amazing experience! 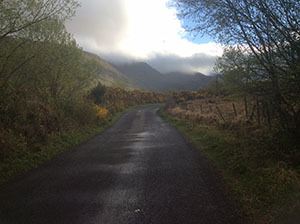 In spring of 2018 I traveled to Ireland with a small group of basket makers. It was an absolutely delightful adventure and I was completely charmed by the country. The beautiful landscape, friendly people, ancient architecture and old stone walls enclosing tiny spring lambs bouncing over lush green pastures everywhere we went, made for as enchanting a place as one could imagine. Our group took two workshops with well known Irish basket makers, Allison Fitzgerald and Joe Hogan. These provided me the opportunity to learn a good deal about the weaving techniques of traditional willow basketry which is very different from my bark work. 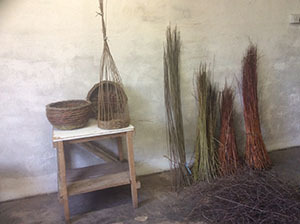 Willow rod basketry is done from cultivated cuttings, generally one year old shoots, and is a centuries old traditional craft. Many different cultivars of willow have been developed over the years which offer varied selections of length, diameter, colors and flexibility. The finished baskets are amazingly strong, functional and very beautiful. Being a self-taught bark weaver working in solitude throughout my career, I very much enjoyed the experience of gaining age-old basketry skills from two traditional master makers. Both Allison and Joe do beautiful contemporary work, as well, but they honed their weaving skills in the old basket making traditions of the region. Cozy peat fires, old pubs, charming cottages, ancient stone churches, cemeteries, walls and castles, delicious food, lovely cheerful people, good traveling companions, satisfying work and beautiful baskets....what could possibly be better than that?! In August 2016 I journeyed with seven other professional basket makers to France and Denmark taking classes with Ane Lyngsgaard and Eva Seidenfaden, two outstanding women, weavers and teachers. They both hosted us in their enchanting homes, guided us to two amazing basketry festivals, one in Vallabregues, France, the other in Denmark, and made sure we all enjoyed a most memorable life experience. The variety, quality and richness of European basketry on display at the festivals was a stunning discovery for me and the whole two week traveling and learning experience an absolute delight! Our lodgings ranged from a beautiful country farmhouse to a medieval village home in the south of France and Ane's astonishing old dairy factory turned home and studio to Eva's exquisite estate in Denmark. 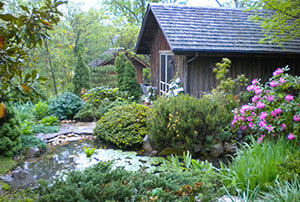 I worked with cultivated willow bark (different from the wild willow bark I use in my baskets), rush and iris leaves. I loved the softness of the damp leaves in my hands and look forward to experimenting more with those fibers. I recently won the Bronze Award at the 2017 Smithsonian Craft Show. Pretty exciting! A Measure of the Earth from Billy Sims on Vimeo.